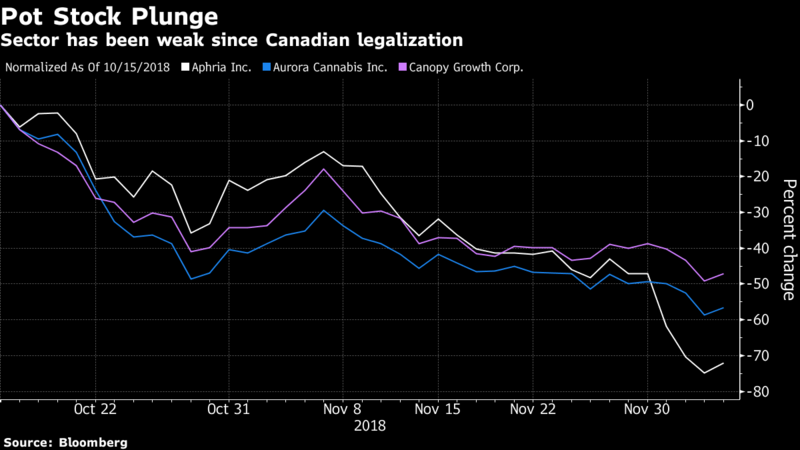 Pot-stock euphoria appears to be wearing off, with a short-seller report targeting Aphria Inc. (APH.TO) raising broader questions about governance and financial disclosure in the adolescent industry. Aphria’s stock price was chopped in half and several other pot stocks including Aurora Cannabis Inc. (ABC.TO) and Canopy Growth Corp. (WEED.TO) fell following the report from Quintessential Capital Management and Hindenburg Research, which alleged Aphria paid inflated prices for assets held by insiders. The Leamington, Ontario-based company is vigorously defending itself, saying the purchase was a transaction negotiated at arm’s length and that both companies retained professional financial advisers. It called the allegations “false and defamatory,” and Chief Executive Officer Vic Neufeld told BNN Bloomberg that it will soon provide a detailed, line-by-line rebuttal of the short report. On Thursday, Aphria said it appointed a special committee of independent directors to review its recent acquisition of LATAM Holdings Inc., which was targeted in the short-seller report. To be sure, there’s also plenty of lingering optimism in the sector. Cronos Group Inc. confirmed Monday it’s in talks with tobacco giant Altria Group Inc., sending its shares up by 16 per cent over two days. And as global stocks swooned on Thursday, pot stocks were a bright spot, with Aphria rising 6.7 per cent to us$5.28 at 10:00 a.m. in Toronto.